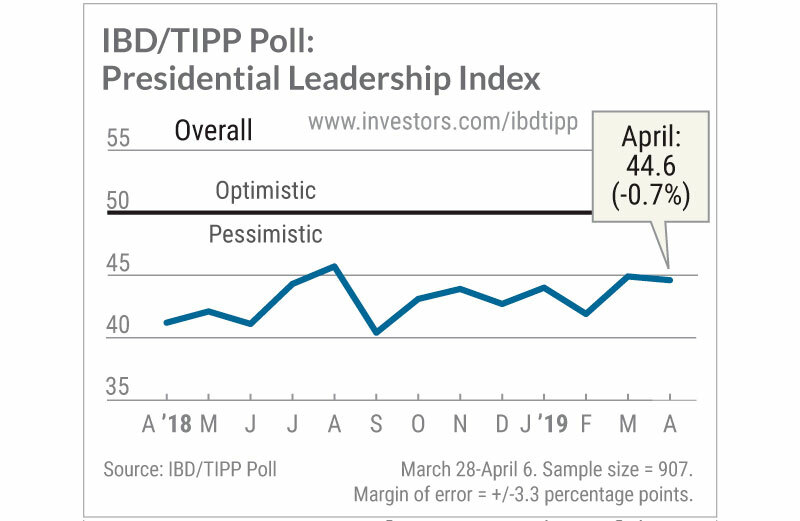 Each month, the IBD/TIPP Poll, a collaboration between Investor’s Business Daily and TechnoMetrica, produces an exclusive Presidential Leadership Index. 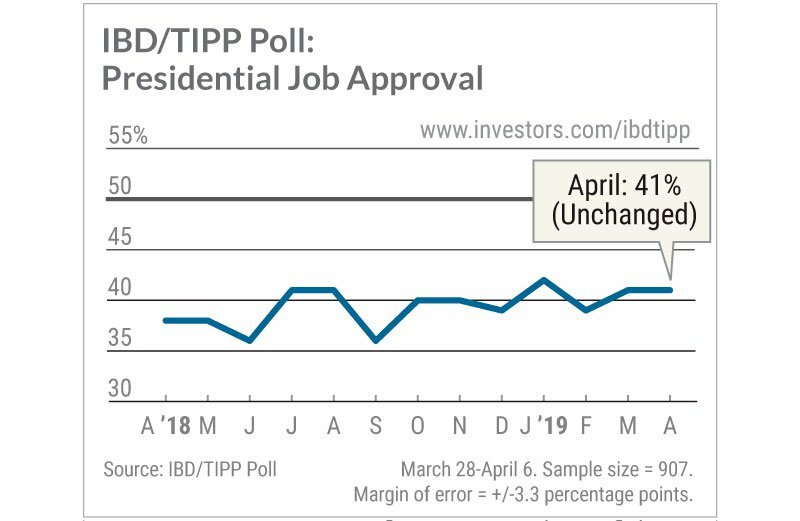 In addition to tracking President Donald Trump’s job approval rating, the index combines results from several questions in the monthly IBD/TIPP Poll to gauge how well the president is viewed when it comes to leading the country, both domestically and internationally. The index includes questions on presidential job approval, favorability measures on the president’s handling of domestic and foreign policy issues, and whether the president is providing strong or weak leadership. 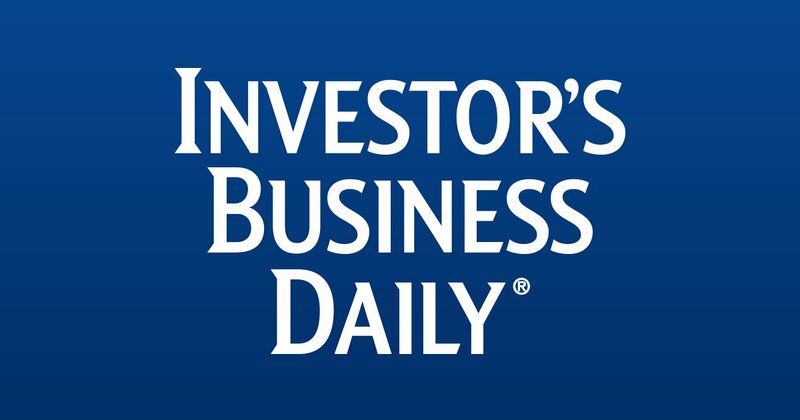 In addition, IBD/TIPP each month asks questions focused on the public’s outlook overall. These questions gauge satisfaction with the direction of the country, respondents’ quality of life, and the United States’ standing in the world. 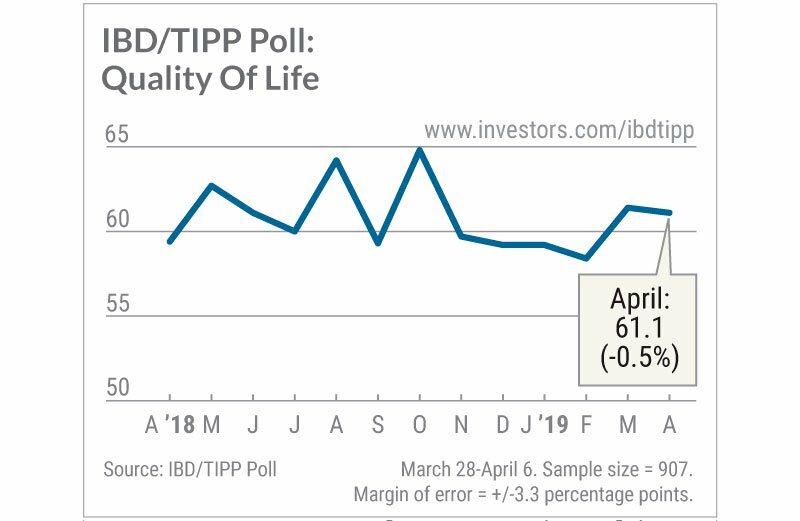 IBD/TIPP also produces the Economic Optimism Index at the beginning of each month. 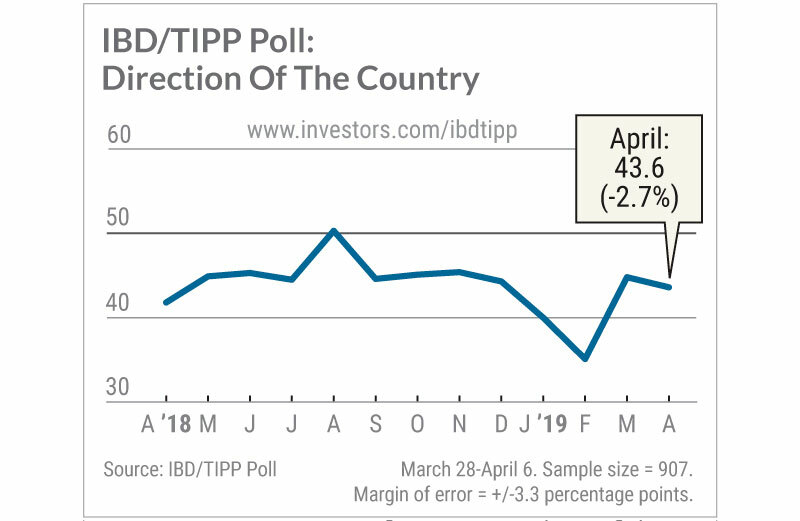 The IBD/TIPP Presidential Leadership Index dipped 0.7% in April to 44.6 following a jump of 7.2% in March. The highest reading President Trump has scored on this index was in his first full month in office, when it stood at 49.2. The lowest came in August 2017, when it fell to 35.9. The Leadership Index comprises three subindexes measuring the president’s favorability (unchanged in April), job approval (unchanged in April), and whether he is providing strong leadership (down 4.1%). In April’s poll, President Trump’s job approval remained unchanged, with 41% saying they approve of the job he’s doing. 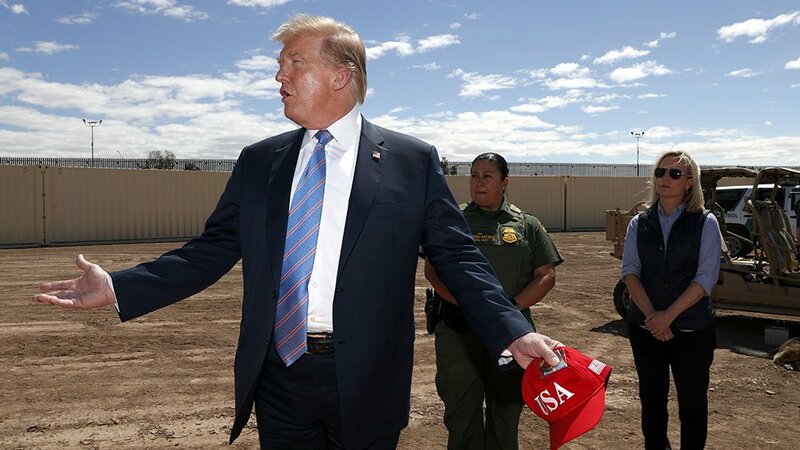 Fifty-two percent say they disapprove of the job he’s doing, which is down one point from March and five points from February. The Direction of the Country Index fell 2.7% to 43.6 in April, but that followed March’s 27.6% surge. This index remains above its 17-year average of 41.7. It’s also above the average of 37 under President Obama. Anything under 50 registers dissatisfaction with the direction of the country. The Quality of Life Index also dipped in April, falling -0.5% to 61.1 after March’s 5.1% gain. It remains above the average for this index under President Obama, which was 53.7. Unlike other measures, the Quality of Life Index has been relatively steady over the past 17 years. 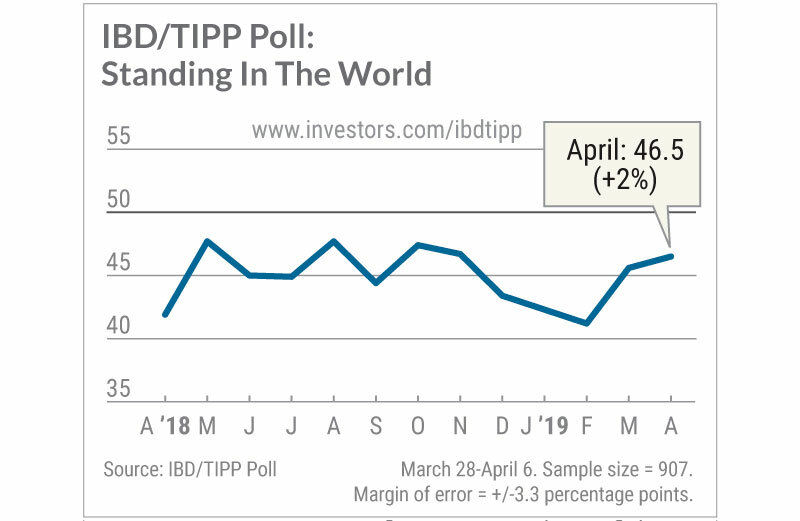 The Standing in the World Index rose 2% to 46.5, following March’s 10.7% gain. Before that, the index fell for four straight months. It’s now just above the 17-year average for this index of 45.5. 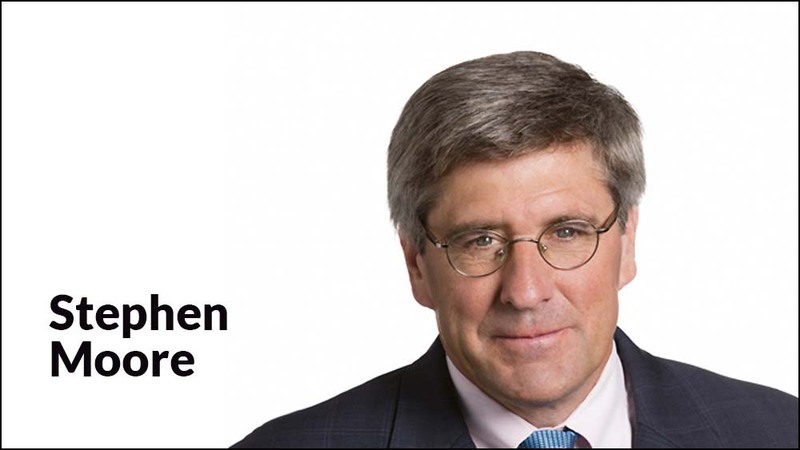 It averaged 42.6 under Obama. Over the past 17 years, the highest this index ever reached was immediately after 9/11, when it hit 74.9.